One entire room of Samuel Levi Jones’s solo show at Galerie Lelong in New York City this past December was dominated by his multi-panel work Talk to Me. In it, 33 squares arranged three high by 11 across are each made up of 24 smaller rectangles in shades of mustard, wheat-yellow, burlap, drab, and gray, which, upon reaching the eye of the beholder, combine into a pixelated strip of gold commanding almost 40 feet of wall space. Though larger than many of his other pieces, it’s archetypal of the work for which he’s become known, constructed from books that have been stripped of their pages, titles, authors, and text—their covers displayed bare. In the case of this work, and the others on view at Lelong in primary or multicolored combinations of green, blue, and red, it’s deconstructed law textbooks. The artist found his medium while studying as a graduate student at Mills College in Oakland, California, where he was introduced to Gerhard Richter’s 1971–72 series “48 Portraits,” which depicts writers, scientists, composers, and philosophers of the 19th and 20th centuries who are credited with influencing modernity. 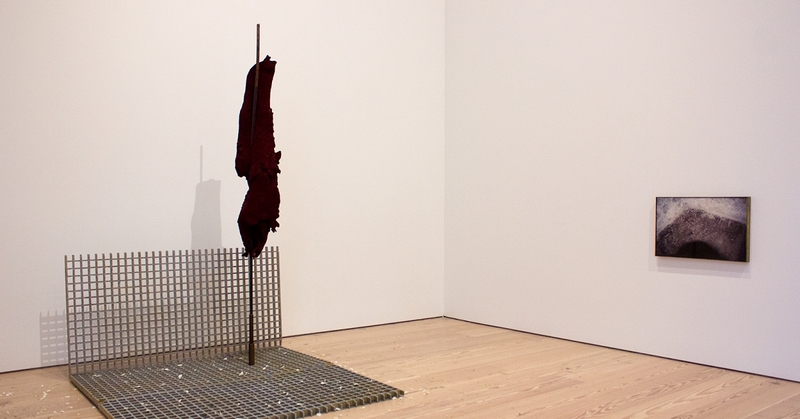 A seminal work for the German artist, it was exhibited at the 1972 Venice Biennale. All of Richter’s figures are white males. Discovering that the images he worked from were taken directly from an encyclopedia, Jones focused his own attention not on Richter’s work, which admittedly rankled, but on the source. 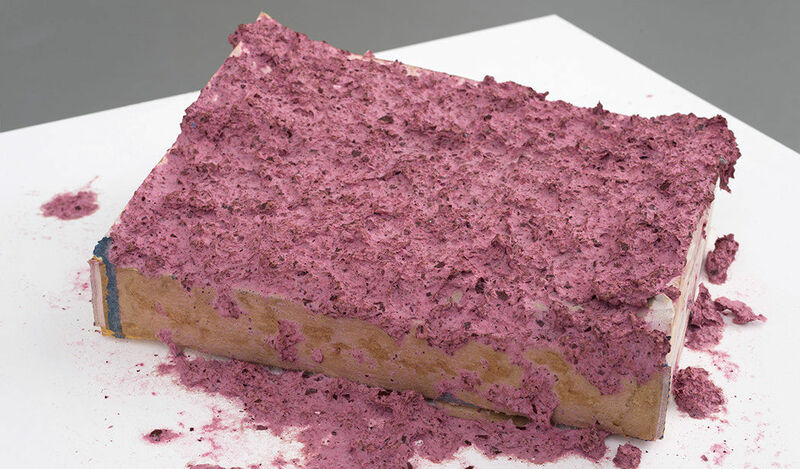 It was at the end of that summer that a conversation with artist Mark BradFord, who he met when both artists participated in the group show “75 Black Artists in Los Angeles (BAILA),” pushed him to go further with the medium. “We were talking about where I was going in my work, and I honestly didn’t really have an answer. I wasn’t sure. I had been working on the encyclopedia material but he really encouraged me to keep investigating it.” So Jones took his books and began to tear them apart. In deconstruction, he found a method of calling into question the purported truth of the items, asking what exactly gets recorded, what is omitted, and who is doing the documenting. The outcome—his stripped and ruined covers—is a perfect example of what happens when you display an object that was originally intended as a tool for informing in a way that renders that function impossible. The books have been muted, but it’s a loud silence—a noticeable vacancy. Though ridding his medium of its wording, Jones chooses to make selective revelations through the supplemental text that commonly accompanies works of art: The medium provides details about what information the books once held, and his titles often deliver a pithy punch. 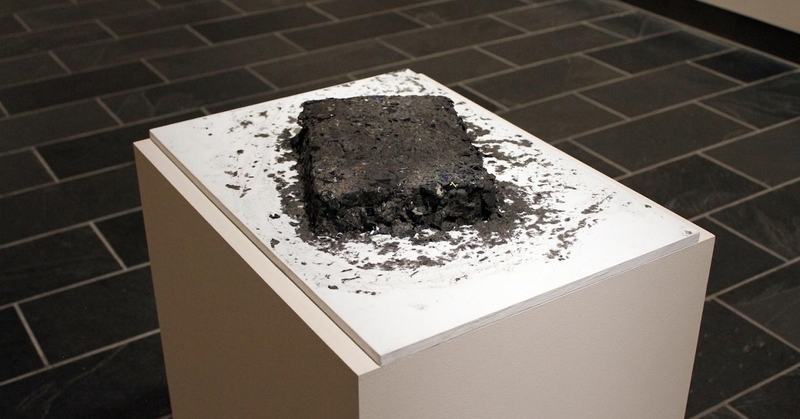 “Talk To Me” was also a central piece in the artist’s 2015 solo exhibition at the Indianapolis Museum of Contemporary Art, “After Fred Wilson.” While it’s easy to make a connection between Jones and the titular artist’s practice of coopting museological tools to comment on institutional representations of marginalized social groups, the story goes deeper. Jones was drawing attention back to a debate that was waged throughout 2010 and 2011 over Wilson’s controversial proposal to recreate the only African American depicted in Indianapolis’s Soldiers and Sailors monument in a new public sculpture for the city’s “Cultural Trail” downtown. The figure, a recently freed slave, would be seated, as he is in the original version, but in a more upright position, with a flag of the African diaspora instead of the broken shackles it once had. Criticism came from all sides, but it was the voices who held that any depiction of a freed slave would ultimately not be uplifting for the African American community that led to the project’s cancellation. Abandoning the project was one thing, but like Wilson, who embraced the ensuing debate, Jones realized the dialogue was important. “I wanted the discussion to keep going, I didn’t want to just let it die or let it be ignored.” Mostly, what Jones is hoping to do with his work is simply to start—or continue—a conversation. And he himself was in support of the work. “I was highly disappointed when the plans didn’t go through,” he says. “I was thinking about people who don’t have access to museums or wouldn’t be inclined to go into a museum, and how someone walking down the street might see Wilson’s sculpture, and, being curious, read a plaque or whatever information was there and learn about the work, and understand something.” The artist grew up about 70 miles away, in the small working class town of Marion, Indiana, where, as he describes it, exposure to the arts was almost non-existent outside of his high school art classes. It wasn’t until his last semester in college at Taylor University, where he was majoring in communications studies, that he took a photography class. “Something just made sense about it,” he remembers. “I really enjoyed working with a camera, being in a darkroom, and learning how to frame images.” So after his wife—whom he met while studying at Taylor—finished her nursing training, Jones decided to try out art school, enrolling in Herron School of Art and Design in 2006. “I didn’t have any clue what I was getting myself into,” he says, laughing. “I just thought, I’ll go into it with an open mind and see what happens, thinking that I would be taking a bunch of photography classes. When I was told I had to take three semesters of drawing, I freaked out.” But the initial shock soon wore off. Jones credits the mentoring of instructor Linda Adele Goodine, who spurred him to think about the conceptual side of his work. “That was actually a very pivotal moment for me. I felt like I was finally having a real experience with art. Up to that point it was more about the past and history of it.” And by about halfway through his studies Goodine had already started encouraging him to think about graduate school, at least as a way to qualify him for teaching. But his move to California opened things up: L.A., he posits, is a place where collectors and galleries are a little more willing to take risks on younger artists. “It feels like there’s more attention there for emerging artists of color.” A chance meeting with Franklin Sirmans led to Jones’s first visit to the Los Angeles County Museum of Art, which included a personal tour from the chief curator. After that and the baila show, everything seemed to snowball. Papillion represented Jones in L.A. for a number of years, and now he will open his first show with Susanne Vielmetter gallery on May 20. 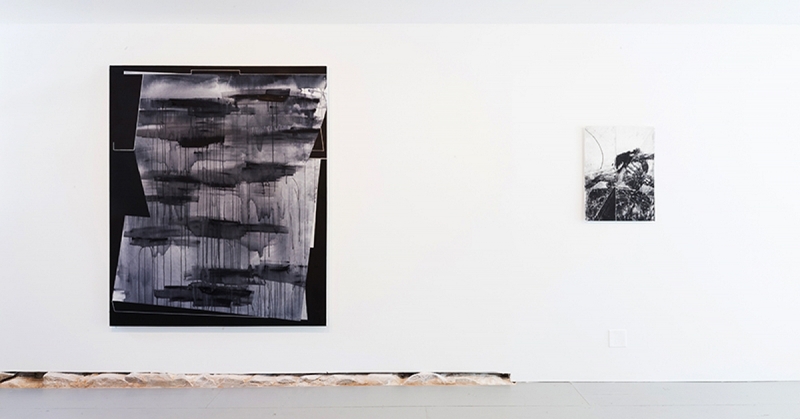 Galerie Lelong announced its representation of Jones late last year, and he has also joined the roster of Patron Gallery in Chicago, after relocating there with his wife and two children two years ago.